[PDF] A Course Book in English Grammar: Standard English and the Dialects (Studies in English Language) | Free eBooks Download - EBOOKEE! Description: The study of language in written texts and transcripts of speech is greatly helped by a student's abilityBB to identify and describe those prominent features of the grammar which make one variety of English different from another. A Course Book in English Grammar looks at many of the problems encountered by students and encourages them to find their own answers and to assess hypotheses about grammatical description. There are activities at each step, using authentic written and spoken data. Using 'real' texts avoids the faking of evidence to be found in some traditional grammar books, and interesting problems of analysis that arise in such texts are a source of useful discussion. The book has been thoroughly revised and expanded for this second edition, which contains additional chapters and material. A new opening chapter discusses the concept of 'grammatically correct English' and the differences between descriptive, prescriptive and proscriptive approaches to the writing of grammar books. 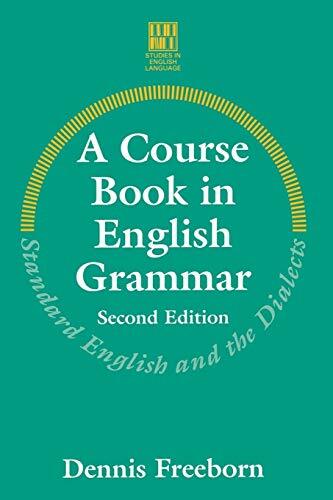 The book is a systematic description of Standard English, and examples of contemporary spoken dialectal grammar are introduced and analysed to illustrate the differences between standard and nonstandard usage. A Course Book in English Grammar will prove invaluable to all students of English Language. 2018-01-26[PDF] A Marvelous Book about Cakes: Discover Many Special and Delicious Cake Recipes That Can Make You Happy Any Day! No comments for "[PDF] A Course Book in English Grammar: Standard English and the Dialects (Studies in English Language)".